And the papal winner is…. 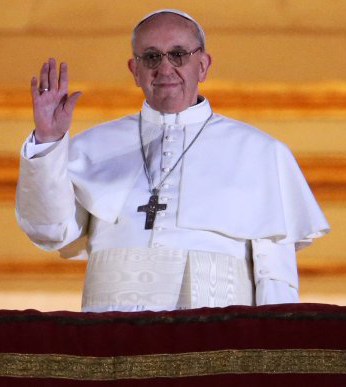 Cardinal Jorge Mario Bergoglio Of Buenos Aires, has been elected to be the 266th pope of the Catholic Church, taking the name Pope Francis. So the new pope is Pope Frances I. At first, the name threw me. Pope Francis? Really? I expected something a little more traditional. But when I stopped to think about it, maybe a non-traditional pope is what the Catholic religion needs. I don’t know much about Jorge Bergoglio, but maybe he’ll be a pope more in touch with the 21st century. Again, not Catholic, but I look forward to finding out more about this guy, and about Jesuits in general, and watching the pomp and ceremony that goes along with the papal installation. Let’s hope he’s not just more of the same.